Trauma and Orthopaedic surgery is one of the most competitive surgical subspecialties to get into (see competition ratios). There are a number of possible surgical training pathways to take to become an Orthopaedic surgeon. After completing Foundation Year Training and Core Surgical Training (or attaining the equivalent competencies elsewhere), doctors apply for Higher Specialty Training in Trauma and Orthopaedics and attend the ST3 interviews. There are a number of run through posts available for academics but these are very few and have a separate application process. T&O makes up approximately 30% of the surgical workforce in the UK. 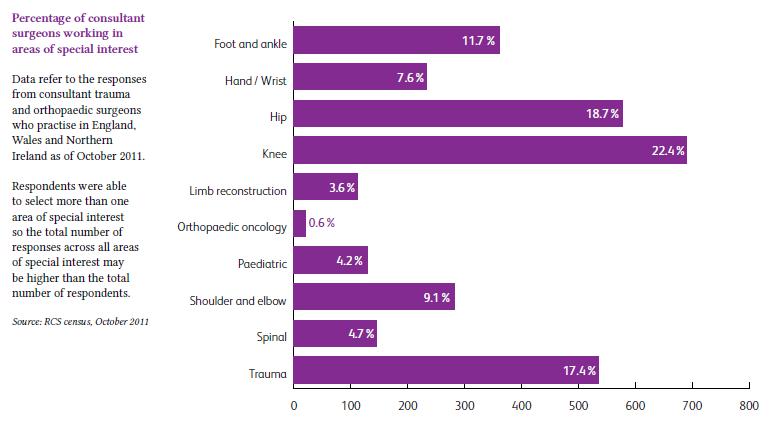 The largest sub specialities within T&O are Knee, Hip and Trauma. 2/3 of T&O consultants undertake private work in addition to their NHS workload. Previously a male dominated specialty but this is decreasing – 6% of T&O consultants and 19% of T&O trainees are female (as of 2017). 70% of current T&O consultants obtained their primary medical degree from the UK.